Stretch arrived at FCER (actually, the vet clinic) on 4-2-2011. After 3 weeks of watching him languish at the sale barn with a slaughter sticker attached to him, the owner finally gave him to us. All done through an intermediary, of course. Rescues are usually not welcome at sale barns. Stretch stunk. The odor was putrid. With the skin peeled off his spine from withers to hip, he had dried crusty puss in streaks down his sides. He was in a pen with 40 or so other horses, all marked for slaughter and the horrendous trip to Mexico. Stretch was picked on, and emaciated on top of all the rest of the obvious wounds. He's a five year old off the track thoroughbred gelding. X-rays revealed at least 11 fractures in the vertebrae in his withers. The infection required weeks of intensive therapy. A particularly stubborn pocket of infection just would not clear up. Finally, it did. After 4 weeks Stretch was able to come to FCER to continue his rehabilitation. His back is healing. A note from Debbie - CEO and Founding Director. I have never before put an editorial comment with an incoming horse. The treatment Stretch received before coming here is absolutely outrageous. How did he come to have 11 fractures in the vertebrae in his withers? The obvious answer is trauma. 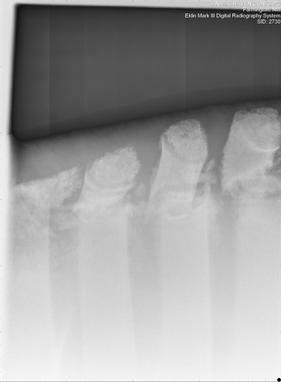 The vet informs us that the fractures and the skinned back did NOT happen at the same time. 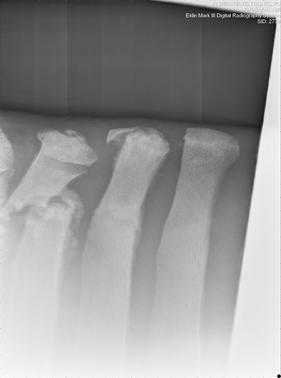 The fractures came first. Could the skinned backbone be the result of a tall horse crammed into a double decker trailer? It very likely. And finally to address the emaciation. It takes months for a horse to get this thin, even a racehorse. Who could have watched this horse endure all he has and not done something humane for him? Who could be so heartless as to stuff this suffering animal on yet another semi truck to endure a painful beyond belief journey to the hell hole of Mexico? And all this happened right here in the United States. Where are the authorities? Where is our public consciousness? How loudly do we have to say - NO MORE! Slaughter breeds cruelty - no if's, ands, or buts. It is time to stop this unnecessary, inhumane and shameful dirty little secret in America. UPDATE - 05-12-12 Stretch has been adopted! 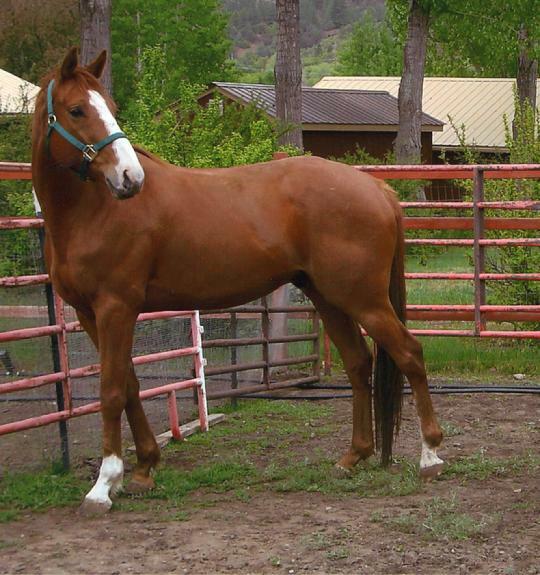 He will have a wonderful home in Durango, Colorado along with another FCER horse - Joker. Misty will continue Stretch's rehab with the vet x-raying periodically. Things look good for Stretch and he will be rideable, although with strict usage guidelines, all of which Misty is quite okay with. 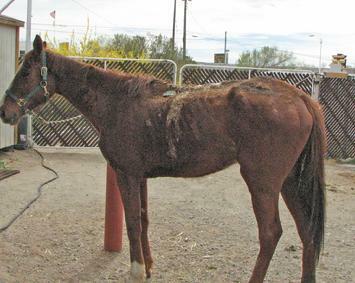 A dream ending for a rejected, beaten and tortured horse once destined for slaughter in Mexico. Here is a link to a youtube video about Stretch - our thanks to Karen for making it.